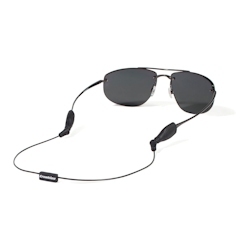 Croakies® ARC system™ features an articulating cable, that adjusts to the angle you prefer, off the neck and collar. The ARC system™ also features MIDDI & MAX ends, that properly fit most temples. Ends snap on and off, for easy interchangeability. These features add up to a lightweight & waterproof retainer that is the perfect fishing companion.